You are here: Home / Crochet Other / Reviews / Book Review / French Made Easy. 10 Minutes a Day. Are you familiar with the 10 Minutes a Day Series? Title: French Made Easy 10 Minutes a Day. I recently found out about the 10 Minutes a Day Series of books. This series includes a variety of different books which closely follow the Canadian Curriculum for math, reading, writing and even French. Each book includes simple activities and questions that can be answered quickly. They come with a 10-minute timer and children are encouraged to answer as many questions as they can in a 10-minute period of time. These books are based on the premise that children tend to learn best when they work on activities that last between 5 and 10 minutes. After this time they tend to lose focus and become easily distracted. The French Made Easy 10 Minutes a Day workbook includes exercises to practice vocabulary, grammar, conversational texts, numbers, colours, sports, food and directions. The book comes with an answer key and parents’ notes too to assist me in answering any questions they may have. 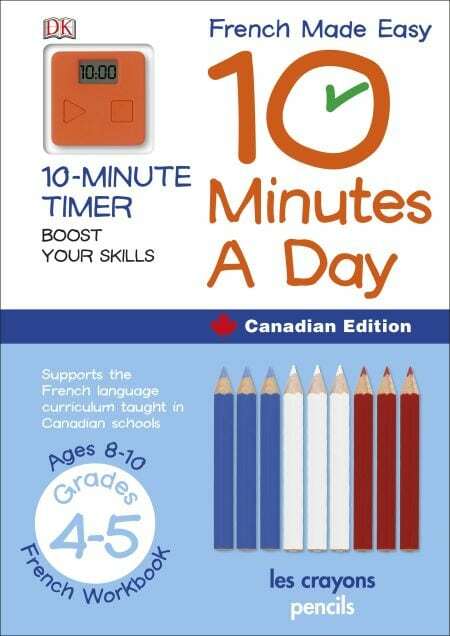 French Made Easy 10 Minutes a Day includes 80-pages. Fill-in-the-blank style questions, matching questions and short-answer style questions are included. The pages are easy-to-photocopy to allow you to practice the exercises more than one time. I am excited to try this workbook with my children to see if they respond to the challenge of working on the book for 10 minutes using the timer. Since my children started basic French in Grade 1 at our school, I am hoping the Grades 4-5 French Workbook will benefit them both. I am looking forward to trying some of the other books in this series with my children. I like having a set time limit for them and giving them some control by allowing them to control the timer. You can purchase your own copy of French Made Easy 10 Minutes a Day directly from Amazon.